Mikayla Ansley of Blyth has won the Lions Clubs International’s Multiple District A peace essay contest, meaning she will represent the area at the world competition this July in Italy. Ansley first won the competition in District A9 last year, which is comprised of local counties east to Orangeville, but was announced as the Multiple District A (Ontario and Quebec) winner late last year. Her District A9 win earned her $100 in prize money, but with her Multiple District A win, Ansley has won $1,000 and a chance for her essay to be crowned the best in the world. The competition, which was spearheaded by Lions Clubs International several years ago, invites students between the ages of 11 and 13 with visual impairments to write an essay on their answer to peace. This branch of the competition was established as an answer to the organization’s peace poster competition but for students with visual impairments. Ansley and her family have now been invited to be part of the Multiple District A convention this May in St. Catharines. There, she will be presented with her $1,000 prize and she’ll read her essay at the youth luncheon. The essay, entitled “Kindness Matters”, details Ansley’s battle with bilateral retinoblastoma, a rare form of ocular cancer that caused her to lose her left eye and most of the vision in her right. Ansley said many people were very kind to her family at a time when both of her parents, Mike and Katie, had to quit their jobs to take her to the hospital on a regular basis. “I’m so thankful to all the people that held our hands through it all, by donating toys, blankets and money so that this family could stay on our feet,” she wrote. She also details the steps she’s taken to pass kindness on in recent years, whether it’s a fundraiser at her school, writing letters to world leaders or simply exchanging a smile. Ansley wrote that the smallest acts of kindness on a daily basis can change the world. Ansley’s journey in the competition began through her father, Mike, who is a member of the Blyth Lions Club. Long-time member John Stewart informed Mike of the competition, specifically aimed at children between the ages of 11 and 13 with visual impairments. From there, Mike and Katie mentioned it to Mikayla and she was immediately interested, although she says she has never considered herself much of a writer. Mikayla has won numerous awards for her public speaking achievements over the years, a forum she says she much prefers. With her limited vision, she said, the physical act of writing or typing on her iPad can be exhausting. However, she committed to writing about a topic she’s passionate about and asked her father to proofread for her before she submitted the essay late last year. 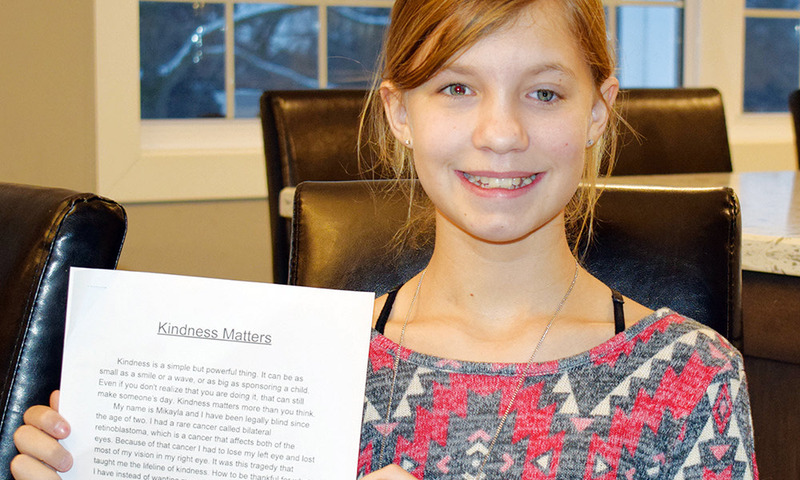 Before Mikayla turned the essay over to her parents, she said she was confident she had done a good job, knowing it was a good opportunity to get the message of kindness across. When Mikayla found out that her essay had triumphed at the local level, she was really happy with her success, but she said she was truly over the moon when she found out about winning the competition at the Multiple District A level. She said it is “such a happy feeling” to think that her essay will be read at the Lions Clubs International event in Milan, Italy this July. That, in itself, she said, is prize enough for her and she’s very happy to think of how many people she’ll be able to reach with her message as a result. Kindness is a simple but powerful thing. It can be as small as a smile or a wave, or as big as sponsoring a child. Even if you don’t realize that you are doing it, that can still make someone’s day. Kindness matters more than you think. My name is Mikayla and I have been legally blind since the age of two. I had a rare cancer called bilateral retinoblastomoa, which is a cancer that affects both of the eyes. Because of that cancer I had to lose my left eye and lost most of my vision in my right eye. It was this tragedy that taught me the lifeline of kindness. How to be thankful for what I have instead of wanting more. During my cancer journey, my parents had to quit their jobs and be at the hospital with me all the time. I’m so thankful to all the people who held our hands through it all, by donating toys, blankets and money so that this family could stay on our feet. It is because of that experience I am on a mission to change the world with kindness, by helping others through their dark times like they helped me through my cancer. In the past, I have written a letter to the minister of Australia in hopes I would change his decision of not allowing the refugees in to his country. Taking their sanitation, food and water away from the refugee camps so that they would leave his country is intolerable. Hopefully my letter was the smallest bit of a difference, people like that need to change. Also I organized a fundraiser at my school, to buy teddy bears for the orphan and abandoned children in Haiti. Because I believe every child deserves something to hold on to and love. I know that the world needs more of that kindness, to live in peace and friendship, without war or abuse. For everyone to believe they are truly safe and happy. Sometimes life can be tough and you might feel like the whole world is against you, believe me as a stubborn legally blind girl it has happened more than once. If you just keep being kind to one another, it can make yours and everyone’s world brighter. If the whole world was filled with smiles and laughter, everything would be great. One day everyone will believe in their hearts, that kindness really truly matters.